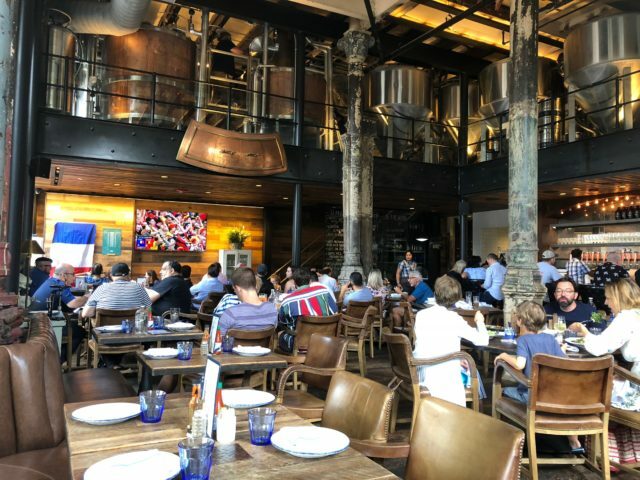 Located in the heart of the Pearl Brewery, Southerleigh is one of the nation’s largest brewpubs and, as you would expect, that their beer is top-notch. But as solid as Southerleigh’s brews are (in particular the Darwinian IPA and Texas Uncommon), they are proving to be just as impressive with their menu. Especially when it comes to lunch. 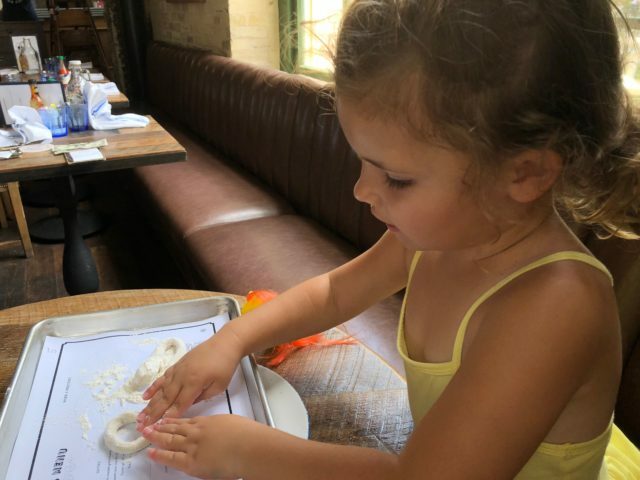 I recently took my little girl (affectionately known as Little Miss Mess) to Southerleigh for lunch as an attempt to let a momma-on-the-mend get some much-needed rest. I saw a post on the Southerleigh Instagram account for specials on a Belgium and French inspired food and beer in honor of the semi-final of the World Cup. This knocked out several birds with one stone: try out their lunch menu, grab a new beer, watch the World Cup, spend time with my daughter and let momma rest. Inside of Southerleigh brewpub. Photo by Garrett Heath. I ordered the fried chicken and waffles (a nod to team Belgium though the waffle was uniquely American) along with their Death by Bobblehead, a Belgium Dubbel that was brewed with both sweet and tart cherries. The chicken-n-waffles came with a choice of a soup or salad and a side, I opted for the salad and the crab macaroni and cheese. The beer was on special for $2 and the lunch was $12—pro-tip: the waitress told me there is *always* a lunch special for twelve bucks! 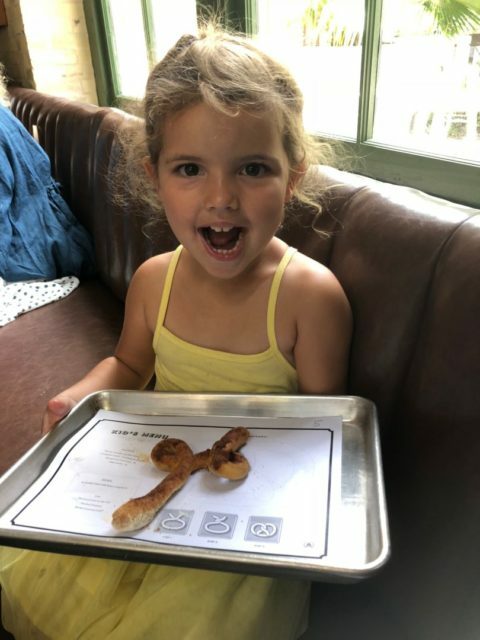 When we were presented with the menu, Little Miss Mess received a tray with some pretzel dough on top of a kid’s menu. This is ingenious folks—children are able to create their own pretzel, helping divert their attention for just enough time for you to make up your mind. 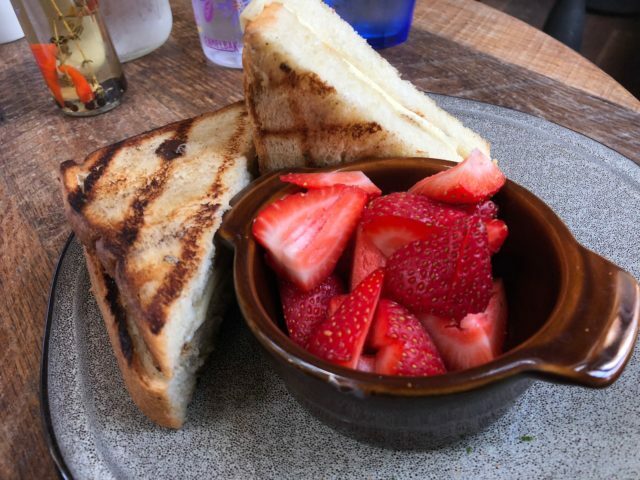 Natalie ordered the grilled cheese with berries ($5) and the waitress whisked off her pretzel creation to be baked after dropping off my beer. Little Miss Mess making a pretzel. Photo by Garrett Heath. While I’m already a fan of Southerleigh’s brews, I gotta say that this Death by Bobblehead rocked it out. The characteristic Belgium yeast was balanced out by the cherry flavor. It was refreshing for the South Texas summer and, packing a 7.4% ABV, I was good with just one. At home, I’m currently making a barrel aged Kriek, a Belgium cherry sour beer, but depending how it turns out I may have to try my hand at replicating Southerleigh’s Cherry Dubble. Death by Bobblehead. Photo by Garrett Heath. Speaking of homebrews, I have to give Southerleigh a huge shout out. 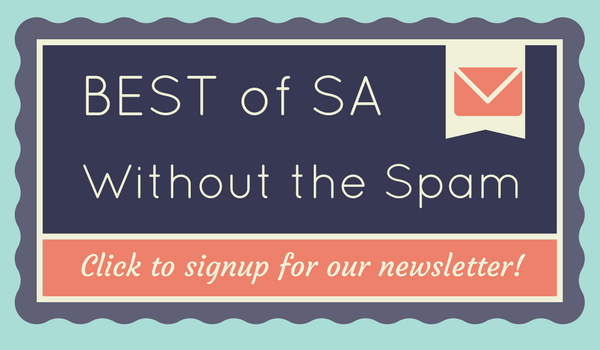 They are really active in the local homebrew community and helped me out as I got started. During the time I got into homebrewing, I was working in the corporate world with Alison Balfour, wife to Southerleigh’s Chef Jeff Balfour, who told me that they had a warehouse of longnecks they were giving away. Somehow the brewpub acquired this bottle style and had no use for it since they use the stubby bottles; I was able to score several cases for my home brewing efforts all while getting some questions answered by one of their brewmasters. The Southerleigh lunch salad. Photo by Natalie Heath. But back to the food. The salad was tremendous, served with a dressing that was lightly poured. 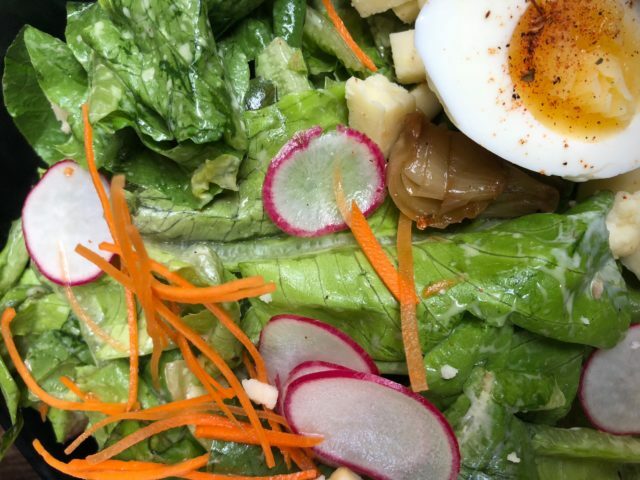 I’m not a fan of hard boiled eggs in my salad and have never tried soft boiled until this salad at Southerleigh (I’m the “don’t egg my salad bro!” kind of person)—it was excellent, and I loved the soft yolk instead of the chalky kind. And they really packed the salad chock full of chunks of white cheddar cheese. Chicken and waffles at Southerleigh. Photo by Garrett Heath. 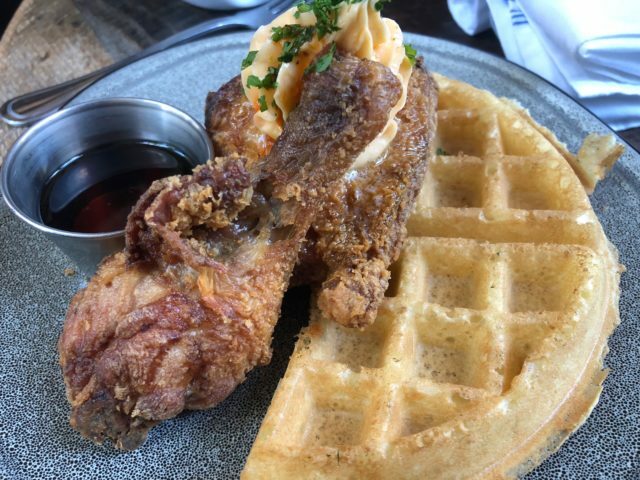 The fried chicken at Southerleigh is some of the best in town—perfectly crispy without being overly greasy along with sensational meat—the Mess also enjoyed as well as snaking half of my waffle. I really enjoyed the cheesy macaroni and it was a shame that I had to leave half of it on the table because I was so full. The kid’s meal at Southerleigh. Photo by Garrett Heath. Little Miss Mess had a bowl full of fresh strawberries—perfectly ripe and juicy. Her grilled cheese was served on two monster pieces of bread and caused a little bit of a problem for her to eat. As she told me, “This bread is too big for my mouth!” Southerleigh might want to consider smaller slices for our littlest San Antonians. The final thing that I will mention can be a plus for some (especially for the beer loving people among us) and a negative for others: Southerleigh does cook their beer in the facility. The smell of a boiling kettle of grains permeates the air. As a person who homebrews, I love the smell of boiling wort. However, I know that this smell may have been a turn off for my wife who has to air out the house when I brew beer. Our meal concluded with the waitress bringing out the pretzel that Natalie made at the beginning of the meal. Her being able to see the finished product, covered with butter, cinnamon and sugar made a sweet ending to a great meal. The finished pretzel! Photo by Garrett Heath. I often rail about how expensive meals are becoming in San Antonio, pricing out many folks from enjoying a nice meal out. But the lunch at Southerleigh proves that there is indeed value along with quality at the Pearl—at $12 (literally only $4 more than many fast food meals) you get a lunch that’s fit for a king. 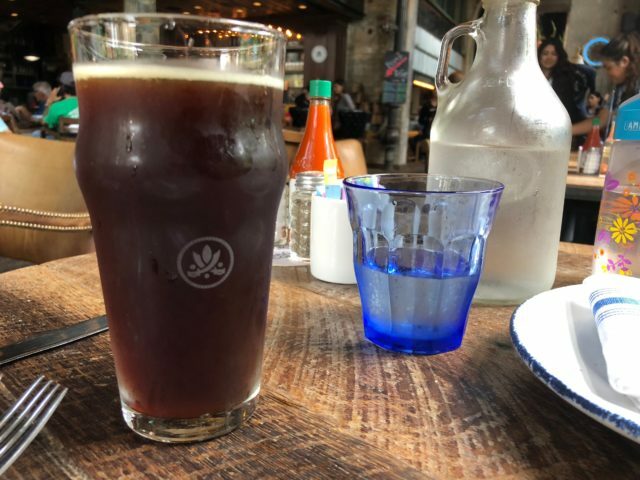 The service and atmosphere are incredible and, if you can pull it off during a work day, adding one of the finest brewed beers in the city doesn’t hurt.